AMS is looking for Sexed Embryos! Qualified service sires (SEXED) include: Dante, Modesty, Jedi, altaHotrod, Duke, Montross, Yoder, Pat-Red, Kingboy, Mayflower, Reflector, Brewmaster, Hangtime, Rager-Red, Epic, Profit, Lautrust, Bombero, Brekem, Capital Gain, Doorman. Both Index as well as embryos show & high scoring pedigrees. If you have SEXED exportable conventional ET embryos but the service sire wasn't on the list. Please don't hesitate to let us know. Embryos must have been produced already and qualify for export. 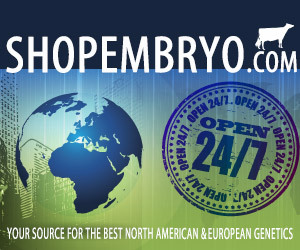 If you have embryos available that meet these requirements please do not hesitate and contact Steve Mower (steve.mower@amsgenetics.com) or Hendrik Albada (hendrik.albada@holsteinplaza.com). AMS is looking for sexed Brown Swiss and Jersey embryos! These embryos must be normal flush embryos (IVF do not qualify) and exportable. If you have embryos that meet these requirements, please email pedigrees, pictures, and an asking price to Steve Mower (steve.mower@amsgenetics.com).